The SS-30 is a 3-channel JFET preamp loaded with maximum power and crunch. 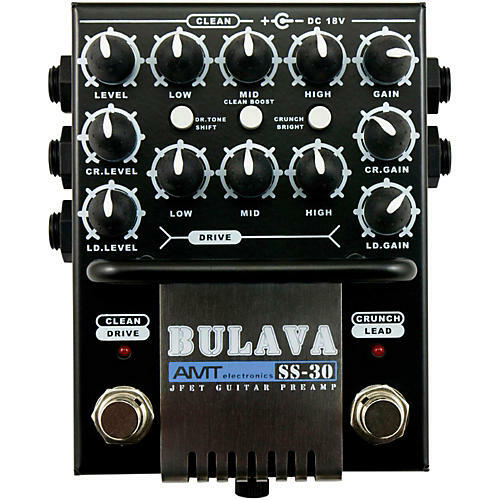 The SS-30 Bulava pedal is a non-tube JEFT driven preamp, offering modern high-gain metal tones in a small, portable enclosure. Priced at a consumer friendly cost, the SS-30 is sure to win the most punch for the buck award. Just listen to the demo and decide for yourself. It features 3 switchable channels, each with their own master control for precise leveling of all channels. Clean and Crunch/Lead have their own 3 band EQ of Low, Mids and High for customization of each channel. The SS-30 includes three switchable buttons for added tone options including drive tone shift, crunch bright and clean boost. The SS-30 also includes an FX Loop for adding external modulation effects in the correct signal chain location. Design focused to simulate ultra high gain amp heads, this gives expensive amplifiers a run for their money! Never has there been such an affordable, feature packed, amazing-sounding 3-channel guitar preamp as the SS-30 Bulava. As all AMT pedals, the SS-30 is equipped with dual outputs. One for connection to a guitar amplifier, and one for direct connection to a computer, DAW or mixing device.